With the new technologies, airports all across the country and world are looking to stop the loss of over 30 million bags a year. This represents a significant cost in terms of money and customer dissatisfaction for the airlines. 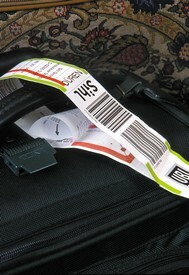 There are new technologies that are being looked at, the most prevalent being RFID to track bags. MASSPORT, the managing concern for Boston Logans airport is looking into the pros and cons of RFID as a baggage tracking technology. With roughly 30 million suitcases lost during air travel every year and a tracking standard — a paper bar code on each item — that is only about 75 percent accurate, airport officials from Logan to Lisbon are searching for new technologies to help stem the tide of lost baggage. An interesting article on how airfares are finally starting to rise and how quickly they can change at airports such as Raleigh Durham International Airport. The costs that the airlines are having to absorb need to be passed onto the consumers if the industry is going to be healthy. It just will take a little time for the passengers to recognize the necessity of it. Increasing fuel costs and decreasing capacity at Raleigh-Durham International Airport are conspiring to create rising fare prices, according to federal statistics. In fact, RDU posted the eighth highest percentage increase in fares in the latest Air Travel Price Index, which compared ticket price changes from the fourth quarter of 2004 to the fourth quarter of 2005 at the country’s top 85 airports. The index is compiled by the U.S. Department of Transportation’s Bureau of Transportation Statistics. While helpful, the index doesn’t give a practical measure of what the change means in terms of actual dollars and cents. Aaron Taylor, vice president of airline consulting firm Eclat Consulting, puts the change in more tangible terms: RDU’s average, one-way fare for a 1,000-mile trip at the end of 2005 was $125, up 14 percent from a year earlier. The rising cost of fuel, which carriers are trying to pass on to passengers, is one of the primary reasons for an increase in fares nationwide. 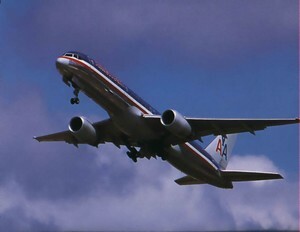 U.S. passenger and cargo planes burned through 19.9 billion gallons of jet fuel in 2005. 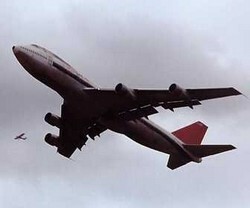 At that rate, a 1-cent increase in the price of a gallon of jet fuel adds $199 million in yearly fuel costs industry-wide, according to the Air Transport Association of America, a trade organization for airlines. Airfares take off at RDU – Triangle Business Journal: . A tax change on aviation fuel has taken money from the national air traffic infrastructure and put it into the highway funds not to mention that it raised the taxes on an already burdened aviation industry. Conrad Burns, the Republican Senator from Montana is looking to remove this tax until 2007 when the tax is supposed to expire so that it can be studied. This is a very wise move. The current rule, enacted last year, has raised the cost of business aviation only slightly. But it has irritated general aviation fuel vendors while directing millions of dollars to the highway trust fund that had previously gone to fund aviation infrastructure and operations. Burns’ bill would suspend the rule until Sept. 30, 2007, when all aviation taxes will expire and need to be reauthorized. Proponents of the measure say the time is needed to study how difficult compliance with the rule change has been for fuel vendors and to further investigate the issue that prompted it. The rule, which took effect October 2005, was created in response to reports of truck operators buying aviation fuel to fraudulently avoid the higher fuel tax rate, 24.4 cents per gallon compared with 21.9 cents per gallon. Organizations that fought the rule disagree that such fraud is widespread, saying they have yet to see statistical evidence of trucks filling up on aviation fuel. via The Business Journal of Jacksonville: . As Delta Air Lines prepares to exit bankruptcy they are working hard to change the focus of the airline to more of an international carrier. They are looking to increase international revenue to 35 percent from the present 20 percent, and they are hoping that successful growth in the Caribbean will help them achieve these goals. In the last three months, Delta has begun more nonstop services, including flights to San Pedro Sula and Roatan, Honduras from Atlanta. Among other new routes are Atlanta to Santo Domingo and Punta Cana, Dominican Republic, and new service to Antigua and Barbados. New flights to the Puerto Rican cities of Aguadilla and Ponce, and Kingston, Jamaica are also planned for June, said James Sarvis, director of Latin America and the Caribbean. Delta’s goal is to increase international revenue from 20 percent of revenue to 35 percent by September, and to rank second in Latin America — excluding Mexico — and the Caribbean by the end of this year, Whitehurst said. At the same time, Delta has cut domestic capacity by 15 percent and converted wide-body aircraft for international use, mostly to Europe, where it also aggressively expanding its service. It expects to be the world’s largest carrier between the United States and Europe this summer. The moves come as Delta cuts 7,000 to 9,000 jobs and trims costs in an effort to emerge from bankruptcy next year as a much leaner, lower-cost carrier. At the same time, it is trying to change from a ”frankly stodgy” culture to ”innovative and stylish,” Whitehurst said. As it pushes into Latin America, the airline is adding Spanish language check-in kiosks, making Spanish announcements on flights and ensuring that every flight to Latin America has Spanish speakers aboard, Whitehurst said. Even though it does not have regulatory approval to fly, Virgin America is getting ready to hire the first 6 flight attendants for the new airline. With help from Governor Arnold Swartzenegger, Virgin America is acting confident that all their regulatory approvals will pass in the near future. Virgin America Inc. is about to hire the first of roughly 100 pilots it wants to add in 2006 as the startup airline continues preparations to start flying this year. The Burlingame-based airline said it will begin by hiring six pilots. Those six need to be veteran flyers because they will help Virgin America as it seeks necessary regulatory approvals. Virgin America said it is reviewing pilot resumes and will make job offers around March 1. Training will start in April. via San Francisco Business Times: . In the face of increased competition and an improved outlook, Hawaiian Airlines is adding 21 flights to its schedule between Hawaii and the West Coast of the United States. The flights will be between Honolulu and Seattle and Sacramento, and Maui to Portland and Seattle. The state’s largest airline said it will add 21 round-trip flights a week to the Mainland starting this fall, increasing the total weekly round-trip flights to 116. The airline also plans to recall 22 furloughed pilots and hire 100 new flight attendants to staff the new flights. “This expansion allows us to bring back more of our furloughed employees, which is an important goal,” said Mark Dunkerley, Hawaiian’s president and chief executive officer. One would never guess one of the best rock climbing locations in the country is Red Rock Canyon. With over 2,000 routes, the region provides climbing opportunities for every level climber. What makes this opportunity even better is that Red Rock Canyon is only 17 miles from the Las Vegas Strip. If you are looking at combining the excitement of Las Vegas and the joy of rock climbing, Red Rock Canyon is a great choice. 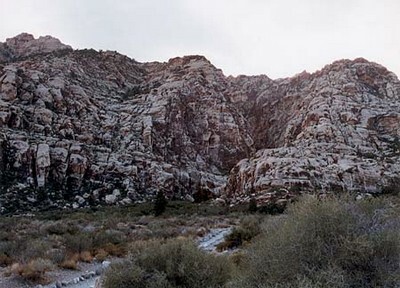 The strange geology of the region, including giant petrified sand dunes, strata thrusts and sedimentary capstone, make Red Rock Canyon a unique and varied climbing environment. Difficult single-pitch (one rope length) climbs flank roadside crags. The mountain faces, reached via wilderness hiking trails, are among North America’s most unrelenting formations: some cliffs reach above 3,000 feet, more than twice the height of the Empire State Building and nearly as sheer. via New York Times . It looks like the cruise ship Calypso had an engine room fire in the English channel as it left Zeebrugge in Belgium on its way to Guernsey. There are no reports of injury on the vessel carrying mostly Dutch passengers. A cruise liner was under tow in the English Channel after it caught fire in the early hours of Saturday with more than 700 people on board. None of the mainly Dutch passengers or the crew of the Cyprus-registered Calypso were injured. Lifeboats and a coastguard helicopter were scrambled but the crew had put out the blaze in the engine room before they arrived. The boat had been making for the Channel island of Guernsey from Zeebrugge in Belgium. It was expected to arrive in Southampton on Saturday evening. A team from the newly-launched Maritime Incident Response Group was lowered on to the vessel to investigate the fire. It was their first live job. The ship had to be towed to port by a tug because its engine could not be restarted. : Cruise liner towed to safety after Channel fire . Las Vegas was known as a place for inexpensive hotel rooms and food to lure you into the hotels casino. The mantra was bring them in anyway you can because we will get the money in the casino. For downtown, that may still be the case, but the strip has changed significantly. Older hotels are being torn down to make room for upscale properties that charge room rates you would expect to find in most major cities. The traffic for the strip is now upscale as conventions, business travelers, and folks with lots of disposable income are flocking into the city and demand for the better things in life is now the rule. No longer is the room just a place to sleep off a big night in the casino. It is now filled with fancy accessories as flat panel televisions, fancy sheets, and exotic soaps. More Visa Las Vegas than Viva Las Vegas. Loud imposing smoke-filled casinos still anchor this town, and $50 rates are still typical at hotels downtown, away from the action. 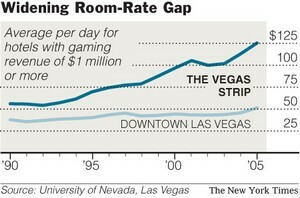 But the Strip, the boulevard of Las Vegas dreams, is no longer home to the low-cost weekend getaway. The trends conform to Las Vegas’s effort to redefine itself as a more diversified destination, offering superb but costly restaurants ($88 for the 12-ounce grilled Kobe rib-eye steak at Tao at the Venetian) and shows like Cirque du Soleil’s “O” ($93.50 to $150 a seat). The new features have helped keep Las Vegas growing even as many new casinos — from small card houses to Indian casinos — are springing up around the country and providing local outlets for gamblers. via New York Times . 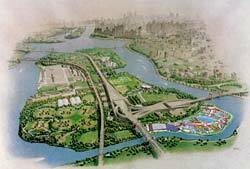 A massive water park is going to be built on Randall Island just north of Manhattan in New York City. The water park is expected to open for the summer of 2007 and will have 80 foot high water slides, wave pools, and an indoor beach. The expected cost of the project will be 168 million dollars and they will be expecting 1.3 million visitors a year. Growing up in the New York suburbs, there are many beaches around that are the main attraction for the summer time. Yet, the lure of Great Adventure in New Jersey is an annual pilgrimage for many and I think this water park will also be a huge draw. The water park, designed by the New York state-based Aquatic Development Group, is a virtual done deal. The city’s Franchise and Concession Review Committee voted on April 11 to allow the proposed 35-year lease with Aquatic Development Group. And so New Yorkers will soon have access to an amenity previously found only in locations like Scotrun, Pennsylvania, or Mason, Illinois, or Grapevine, Texas. The New York attraction will include wave pools, action rivers and wading pools, and plenty of slides. A seven-acre indoor beach will give New Yorkers a year-round attraction; Coney Island, in contrast, is strictly seasonal (except to those twisted Polar Bear Club swimmers who take an annual winter dip in the Atlantic).